In GIMP-2.6, tool presets were not easy to use. You had to click on a tool first, and then click on the Restore Presets... button in the button bar at the bottom of the Tool options dialog... if you had not disabled this button bar in the Tab menu to make place on your desk! Now, with GIMP-2.8, a dockable Tool Presets Dialog is available where you just have to click on a preset to open the corresponding tool with its saved options. The “Tool Presets Dialog” is a dockable dialog; see the section Paragraaf 2.3, “Koppelen van dialoogvensters” for help on manipulating it. or, as a tab in Toolbox window, through Tab Menu → Add Tab → Tool Presets. This dialog comes with a list of predefined presets. 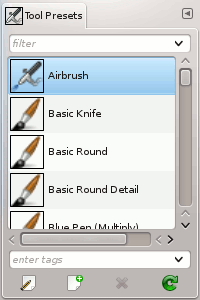 Each of them has an icon representing the tool presets will be applied to and a name. Presets can be tagged so that you can arrange presets display as you want. Please see Paragraaf 3.6, “Tagging” for more information about tagging. 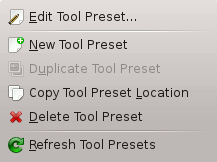 Double-clicking on a preset icon opens the Tool Preset Editor. Double-clicking on preset name allows you to edit this name. Edit this tool preset: clicking on this button opens the Tool Preset Editor for the selected preset. You can actually edit presets you have created; predefined presets options are all grayed out and inactive. But you can create a new preset from a predefined preset and edit its options. The Tool Preset Editor is described in Paragraaf 5.2, “Tool Preset Editor”. Create a new tool preset: before clicking on this button, you can either select an existing preset, or select a tool in Toolbox, for example the Healing Tool which is not in the presets list. A new preset is created at the top of the dialog and the Tool Preset Editor is opened. Please see Paragraaf 5.2, “Tool Preset Editor”. Delete this tool preset: this button is active only for presets you have created. Refresh tool presets: If you have added a preset manually in gimp/2.0/tool-presets folder, you have to click on this button to include it in the presets list. 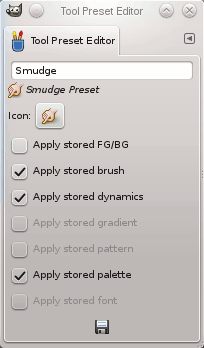 With GIMP-2.8, tool presets are saved in a new format (.gtp). To use your 2.6 presets, you have to convert them using http://wiki.gimp.org/index.php/Mindstorm:Preset_converter, until it is included in GIMP. Duplicate Tool Preset: this command is always disabled. It is not necessary since, as we saw above, a duplicate is automatically created when you create a new preset from an existing preset. Copy Tool Preset Location: this command copies the path to the tool preset file into clipboard.